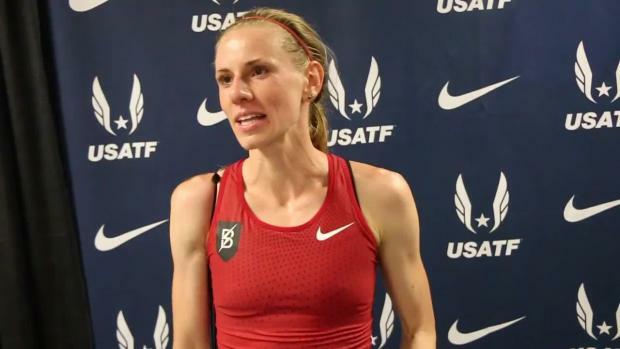 Courtney Frerichs has taken the running world by storm over the past few years, quickly becoming a household name to track and field fans from all over. 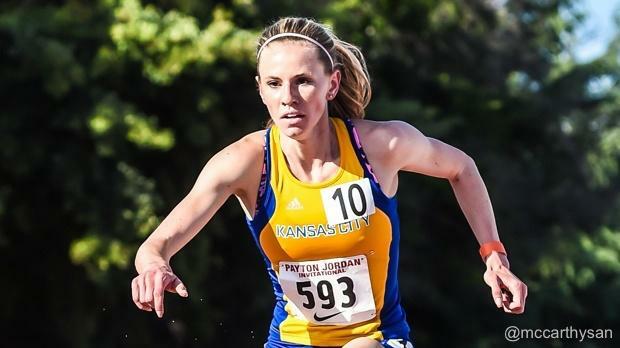 With humble beginnings in the town of Nixa, Missouri, Frerichs first started making headlines while attending the University of Missouri-Kansas City, where she earned All-American honors in cross country, in the indoor 5K and in the outdoor 3000m steeplechase, including a second-place finish in the event in 2015. 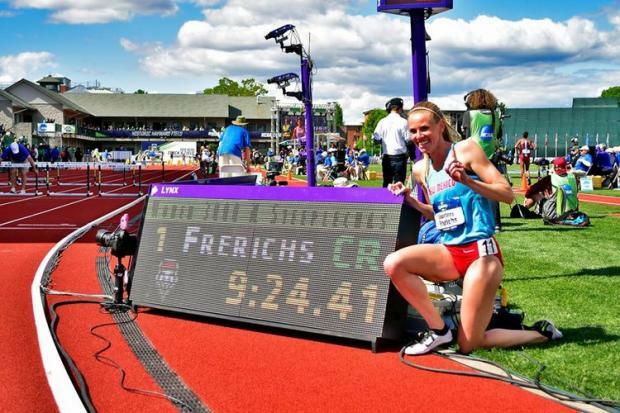 For her fifth year of collegiate competition, Frerichs attended the University of New Mexico, where she placed fourth individually at the 2015 NCAA Division I Cross Country Championships. She was also a vital member of the team's NCAA championship performance, helping lead the Lobos to 49 points that year. The following spring, Frerichs went on to win the NCAA Division I title in the 3000m steeplechase while also setting an NCAA record time of 9:24.41. By the end of her collegiate career, she collected a total of seven All-American honors while also competing at various Junior World Championships. In just a short time after her collegiate career ended, she competed in the United States Olympic Trials in the 3000m steeplechase, where she placed second behind Emma Coburn to qualify for Team USA at the 2016 Olympics in Rio. 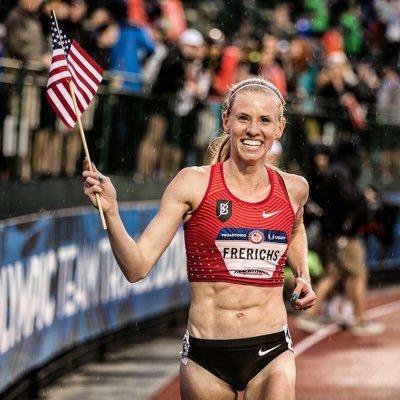 At the time, Frerichs also signed a contract with Nike's Bowerman Track Club, arguably one of the strongest professional distance and mid-distance teams in the United States -- with runners like Shalane Flanagan, Emily Infeld, Shelby Houlihan, and Colleen Quigley to train alongside. In Rio, Frerichs made it to the final and placed 11th overall in 9:22.87. 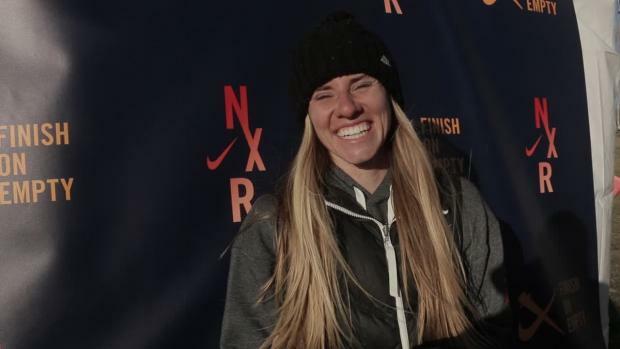 Since her Olympic stint, she's trained hard under coaches Jerry Schumacher and Pascal Dobert in Beaverton, Oregon, with some excellent results to boast, including breaking a steeplechase performance of 9:19.09 -- which broke the elusive 9:20 barrier. One of the biggest pieces of Frerichs' training, she says, is her understand of how to properly fuel her body. Below, check out what a typical day of fuel looks like according to Frerichs. Breakfast: I typically start my morning with yogurt, fruit, and granola, oatmeal with almond butter, or cereal, and of course a cup of coffee with a little vanilla creamer or honey and milk. Eating before I run in the morning is something I just started doing this year so I try to keep it pretty basic so I don't upset my stomach. Lunch: I love brunch food so you will usually find me eating some variation of brunch food post-run. I will often have a veggie and egg scramble with avocado along with a smoothie bowl made with frozen banana, pineapple, cherries, spinach, yogurt, avocado, and milk. I also enjoy having pancakes, especially after long runs. My favorites are chocolate chip, lemon-blueberry, and banana oat. Snack: I'll usually have a snack after my second run or core depending on what I have scheduled in the afternoon that day. I like to have tortilla chips, black bean hummus, and almonds. Dinner: I typically stick to having a carb, protein, and a lot of veggies when it comes to dinner. Spaghetti and meatballs with salad is a weekly staple especially before big races. I've been eating a lot of salmon or steak with veggies and rice or quinoa lately. I always like to have guacamole or teriyaki style sauce with my salmon or steak as well. After dinner snacks: I have a major sweet tooth so staying away from dessert is a big challenge for me. I really enjoy baking things from the Run Fast Eat Slow cookbook like the superhero muffins, sweet potato cookies, and the banana bread. If I don't have any of those made, I'll usually have a piece of dark chocolate. Focus foods: spinach, Brussel sprouts, beets, avocado, whole milk yogurt, red meat. Add-ons: Spinach and red meat are great for keeping iron levels up! Beets are super healthy and really good for endurance athletes so I try to incorporate them when I can. 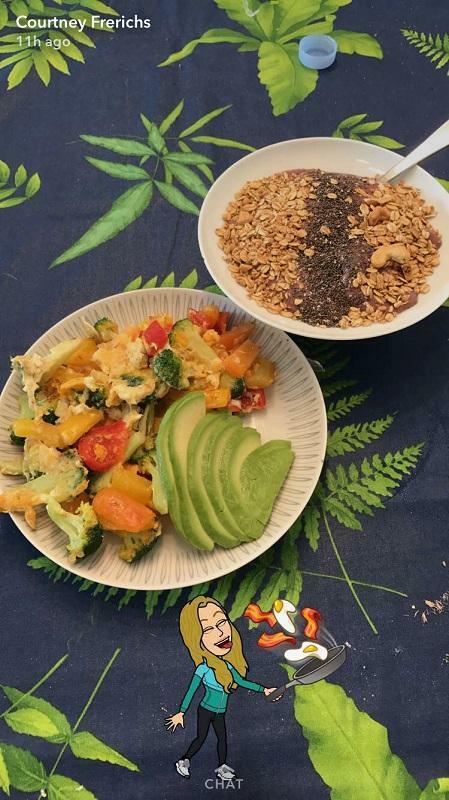 Check out Frerichs on Snapchat, where she often chronicles her meals along with many of her BTC teammates! You can also keep up with her on Instagram @courtneyfrerichs!